Denver Union Station is the main railway station and central transportation hub in Denver, Colorado. 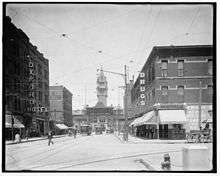 It is located at 17th and Wynkoop Streets in the present-day LoDo district and includes the historic terminal building, a train shed canopy, a 22-gate underground bus facility, and light rail station. A station opened on the site June 1, 1881, burning in 1894. The current structure was erected in two stages, with an enlarged central portion completed in 1914. In 2012, the station underwent a major renovation transforming it into the centerpiece of a new transit-oriented mixed-use development built on the site's former rail-yards. The station house re-opened in the summer of 2014 as a combination of the 112-room Crawford Hotel, several restaurants and retailers, and a train hall. 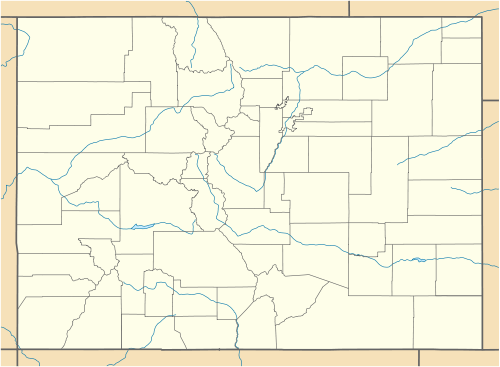 Denver's first train station was constructed in 1868 to serve the new Denver Pacific Railway, which connected Denver to the main transcontinental line at Cheyenne, Wyoming. By 1875, there were four different railroad stations, making passenger transfers between different railroad lines inconvenient. 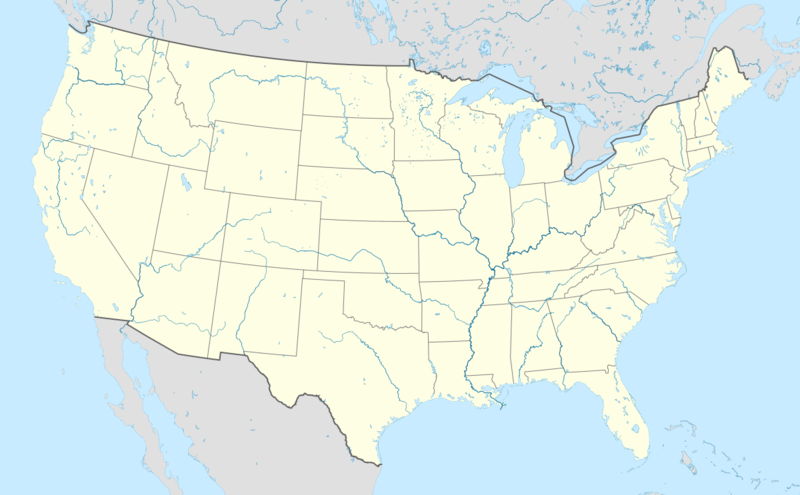 To remedy this issue, the Union Pacific Railroad proposed creating one central "Union Station" to combine the various operations. In February 1880, the owners of the four lines (the Union Pacific, the Denver & Rio Grande Western, the Denver, South Park & Pacific, and the Colorado Central) agreed to build a station at 17th and Wynkoop Streets. Architect A. Taylor of Kansas City was hired to develop the plans and the station opened in May 1881. However, a fire that started in the women's restroom in 1894 destroyed the central portion of the 1881 depot. The Kansas City architectural firm of Van Brunt & Howe was hired to design a larger replacement depot in the Romanesque Revival style. Both the 1881 and 1894 depots included a tall central clock tower with four clock faces. On July 4, 1906, a large arch was dedicated in front of the station in order to provide a symbolic threshold for travelers entering and leaving the city. Constructed at a cost of $22,500 with 70 tons of steel and over 2,000 light bulbs, the arch originally featured the word "Welcome" on both sides. However, the elevation facing 17th Street was changed to "Mizpah", a Hebrew word expressing an emotional bond between separated people, and used as a farewell to people leaving Denver. For the first time in 1958, passenger traffic at Stapleton International Airport exceeded that of Union Station. It was during this period that the orange "Union Station: Travel by Train" signs were placed on both sides of the building in order to advertise intercity rail travel. Amtrak eventually became the sole provider of rail service through the station, operating only two trains daily between Chicago and the Bay Area with the California Zephyr. From the 1980s to the early 2000s, RTD, the City and County of Denver, the original site owner Denver Union Terminal Railway Corporation, and several other entities made periodic improvements such as accommodating an RTD bus lane to access Market Street Station from I-25 and a light rail connection to the C Line. The station also served special trains such as the Denver & Rio Grande Western Railroad's Ski Train, which operated until the end of the winter of 2008–2009; in September 2009, plans were announced to revive the service as a special limited route beginning in December, but this did not occur due to insurance problems. The station also continues to serve the annual Cheyenne Frontier Days Train, which runs between Union Station and Cheyenne, Wyoming for the Frontier Days Rodeo event. The open air train hall and the historic terminal building. In 2001, RTD purchased Union Station and the surrounding site of its old rail yards from the Denver Union Terminal Railway Corporation under a jointly-funded agreement between RTD, the City and County of Denver, the Colorado Department of Transportation, and the Denver Regional Council of Governments, known as the Partner Agencies. A master plan was developed in 2002 that envisioned both the building and surrounding 19.5 acre (79,000 m²) site be redeveloped as the hub of a multi-modal transportation network with transit-oriented private development. The plan was approved by the Partner Agencies in 2004 and was approved by voters in November of that year as the new FasTracks program. After a competition in 2006, the Partner Agencies selected the private Union Station Neighborhood Company as the master developer of the entire site. Its plan called for the transit elements connected to Union Station in the master plan to be constructed in one single phase at an estimated cost of $500 million. In 2008, Hargreaves Associates and Skidmore, Owings & Merrill were selected to design the public spaces including the landscape, train hall, bus terminal, and light rail stations. The project had also received federal funding on July 30, 2010 when a $300 million grant from the United States Department of Transportation helped fund construction of three light-rail tracks and eight heavy-rail tracks for both intercity and commuter rail services, as well as additional storage and servicing capabilities. As construction of the site commenced in 2010, Amtrak's passenger station and boarding platform were moved on February 1, 2011 to a temporary station at 21st and Wewatta streets, behind Coors Field. This temporary relocation lasted until February 28, 2014, when Amtrak's ticketing and passenger services returned to the station. The new light rail station was the first component of the project to be opened on August 15, 2011, two blocks west of the former light rail stations and adjacent to the consolidated main line railroad tracks near the Denver Millennium Bridge. The westernmost stop of the 16th Street Mall shuttle, also known as the MallRide, was also moved west adjacent to the new light rail stop. The new underground 22-gate Union Station Bus Concourse opened on May 11, 2014. On that same day, Market Street Station at 16th St. & Market St. closed permanently after thirty years of continuous use as RTD's bus transit hub. All bus service from Market Street Station was re-routed to Union Station from that day forward. While most of the transit elements of the project have been completed to date, several commuter rail lines will begin service in the open air train hall in 2016. Service between Union Station and Denver International Airport began in April 2016 on the University of Colorado A-Line, running every 15 minutes during peak hours with a travel time of approximately 40 minutes. Service between Denver and Westminster began in July 2016 on the first segment of the B Line, which runs every 30 minutes during peak hours. The travel time between the two stations is approximately 11 minutes. Private development of offices, residences, and retail in the project area and in the site immediately around it also continues to grow with $956 million in private investment. Simultaneous with the construction of its surrounding site, the historic terminal building also underwent a complete renovation. In 2011, a competition between the Denver Union Station Neighborhood Company and the Union Station Alliance (consisting of local firms Urban Neighborhoods Inc., Sage Hospitality, Larimer Associates, REGen, llc. and McWhinney) created different proposals for the future use of the structure. Both plans called for maintaining a waiting area for transit and spaces for Amtrak, the creation of retail spaces, and integrating the interior spaces with the public plazas facing the station. However, the Denver Union Station Neighborhood plan also envisioned a public market and commercial office space while the Union Station Alliance called for the integration of an independent hotel with an emphasis on creating the Great Hall as "Denver's Living Room". By 2012, RTD selected the proposal from the Union Station Alliance to renovate the structure as a hotel at a cost of $54 million with retail, public, and transit facilities and approved a 99-year lease for its redevelopment. The main historic building closed to the public on December 1, 2012 for construction and re-opened July 26, 2014. The majority of the terminal building's upper levels have now become the 112-room Crawford Hotel, with the 12,000 square foot Great Hall on the ground level serving as the hotel lobby, public space, and train waiting room and 22,000 additional square feet of the ground level serving as 10 independent retail and restaurant outlets. 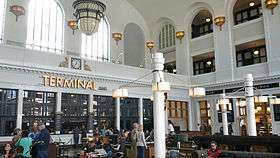 As an inter-modal transportation hub, Denver Union Station consists of the historic terminal building and, on the site's former rail yards, an open-air train hall, a 22-gate underground bus terminal, and a light rail station. The train hall stands immediately behind the historic building and houses tracks for Amtrak and the future commuter rail lines. An entrance between the train hall and the historic building lead directly to the underground bus terminal, which stretches west for two city blocks along 17th Street until it terminates at an above-ground light rail station. Street-level pavilions at the light rail stop/Chestnut Place, Wewatta Street, and at each platform in the train hall provide additional vertical circulation to the bus terminal. Each of these transportation elements are tied together above ground by major public spaces and landscape elements such as the 17 St. Promenade/Gardens, Wynkoop Plaza, and several other public plazas. Historically, a subterranean passage accessed through the northern wing building connected the station to the old rail platforms above. However, the passage and its entrance was demolished with the construction of the bus terminal. Interior view of the renovated Great Hall. The present-day Union Station building consists mainly of two lower wing buildings flanking a larger central mass built during different parts of the station's history. The wing buildings were built with the first 1881 structure in a Romanesque Revival style, featuring tall, narrow windows, rusticated stonework, and motifs of Colorado's state flower, the Columbine. When the station was gutted by the 1894 fire, the facades of the wing buildings were incorporated into the 1894 depot and the 1914 renovation. They originally functioned as offices and other facilities for the station through its history, although today the structures house guestrooms for the Crawford Hotel and several restaurants. The central 1914 portion of the station contains the Great Hall, used historically as the passenger waiting room with ancillary facilities such as a barber shop and a smoking lounge. It was designed in the Beaux-Arts style and features elements such as tall, multi-story arched windows and bays on the facade and in the interior, terrazzo floors, a barrel vault spanning the entire width of the Great Hall, two exterior clocks, a metal canopy along the elevation of the structure, and other classical elements. However, most of the architectural detailing is focused on the station's exterior facade compared to the rather simple treatment of the Great Hall. Its interior lacks the grand ornamentation common for stations of time, most notably on the ceiling, and instead utilizes a simple color scheme, a Columbine motif on the borders of the arched bays, metal light sconces, and some marble paneling. When originally constructed, the Great Hall also included three large chandeliers and ten long wooden benches that incorporated heating and lighting into their framework. However, sometime during the station's history prior to the 2012 renovation, the chandeliers were replaced with flat fluorescent panels. While the renovation saw the return of similar chandeliers as the originals, it also saw the removal of the benches due to asbestos. Other modifications made during 2012 included changing the brown and tan color scheme of the interior to a more neutral white. The old ticket counters and offices were also converted into the Terminal Bar along with several retail and restaurant spaces being created on the periphery of and opening on to the Great Hall. In general, the 2012 renovation sought to create "Denver's Living Room" in the Great Hall by diversifying its functions. It functions today as part hotel lobby, part Amtrak, part waiting area, part retail, and part public space. ↑ "Amtrak Fact Sheet, FY2015, State of Colorado" (PDF). Amtrak. November 2015. Retrieved 7 December 2015. ↑ See Forrest, Kenton and Albi, Charles. "Denver's Railroads: The Story of Union Station and the Railroads of Denver." (1981, Colorado Railroad Museum). (ISBN 0918654319). ↑ Welcome to the New Union Station. Regional Transportation District. Retrieved 06 December 2014. 1 2 3 4 5 6 7 Denver Union Station History and Timeline. Denver Union Station Project Authority. Retrieved 06 December 2014. ↑ Stevens, Mark E., Denver Union Station National Register of Historic Places Nomination, August 1974; p. 2. ↑ Stevens, Mark E., Denver Union Station National Register of Historic Places Nomination, August 1974, p. 3. ↑ Rinaldi, Ray Mark (December 20, 2009). "Mizpah Arch: A gateway to Denver's past and future". Retrieved December 19, 2014. ↑ Fraser, Clayton, and Jennifer Strand. Railroads in Colorado, 1858–1948. Loveland, Colorado: Fraserdesign, 1997, p. 161. ↑ "Denver Union Station Facts: Current, Historical and Fun". RTD Fastracks. Regional Transportation District. Retrieved December 19, 2014. ↑ Leib, Jeffrey (September 18, 2009). "All Are Aboard Plan to Revive Ski Train". The Denver Post. ↑ Leib, Jeffrey (December 29, 2009). "Problems derail revival of ski train". The Denver Post. 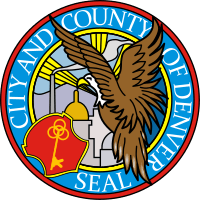 ↑ "Denver Union Station Project Authority Master Plan". Denver Union Station Project Authority. Denver Union Station Project Authority. Retrieved December 19, 2014. ↑ Schroeppel, Ken (August 11, 2008). "Denver Union Station Update". DenverInfill. DenverInfill. Retrieved December 20, 2014. ↑ Schroeppel, Ken (June 18, 2008). "Hargreaves Selected as Union Station Public Realm Designer". DenverInfill. DenverInfill. Retrieved December 20, 2014. ↑ "Denver receives $300 million from USDOT for Union Station project". Progressive Railroading. July 30, 2010. Retrieved July 30, 2010. ↑ Dravitz, Ryan (May 11, 2014). "Goodbye Market Street Station!". DenverUrbanism. DenverUrbanism. Retrieved December 20, 2014. ↑ Proctor, Cathy (April 2, 2014). "Denver Union Station area draws $1 billion in private development". Denver Business Journal. Retrieved December 20, 2014. ↑ Schroeppel, Ken (May 5, 2011). "Historic Station Reuse: Union Station Neighborhood Company". DenverUrbanism. DenverUrbanism. Retrieved December 20, 2014. ↑ Schroeppel, Ken (May 5, 2011). 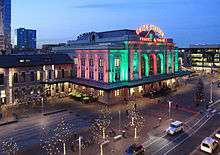 "Historic Station Reuse: Denver Union Station Redevelopment Team". DenverUrbanism. DenverUrbanism. Retrieved December 20, 2014. 1 2 "Denver's historic Union Station redevelopment moves forward with RTD lease approval" (PDF). November 28, 2012. Retrieved December 20, 2014. ↑ Hatlestad, Luc (June 2014). "All Aboard: Denver's Union Station". 5280: Denver's Magazine. 5280 Magazine. Retrieved December 20, 2014. Wikimedia Commons has media related to Union Station (Denver).